The Shark Fisherman Walk Through is perhaps the best layout in this Shark Series for the fisherman. Resembling a bass boat for layout and roominess, the added feature of the maneuverable hull form of the Shark makes it ideal for getting in and out of those tight fishing spot. The boat trolls well with a small 25 to 35 H.P. engine and has ample room under the gunnel for additional fishing gear as required. Windshields and accessories shown in the Walk Through model, such as the upholstered back to back lounge and forward seats, the motor well, bow rails and hardware are at the discretion of the builder and are not included in the complete boat kit. HAVE TO SAY ABOUT THIS BOAT? MAX. 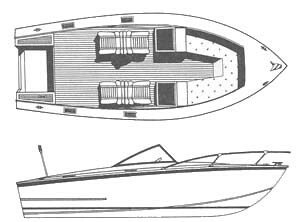 HULL DEPTH 2' 11"
TRANSOM WIDTH TOP 4' 10"